The fall of a hardliner. Whatever happened to Joe Arpaio's run for the Arizona Senate? The former Arizona sheriff was the best known and most controversial of all the candidates to replace Senator Jeff Flake. But he ended up in third place behind Rep. Martha McSally and former state Sen. Kelli Ward. TUCSON, Az – Arizona Republicans went to the polls Tuesday to pick their candidate in the November general elections to fill the vacancy to be left by Sen. Jeff Flake's departure. Former Maricopa County Sheriff Joe Arpaio faced two women in the primary – the favorite, Martha McSally, a two-term member of the U.S. Congress, and former state Sen. Kellli Ward. Despite his high profile in the immigration wars, Arpaio got only 19.5% of the vote, coming in third behind the comfortable winner, McSally, with 52%. A former Air Force colonel, McSally will face Democrat congresswoman Kyrsten Sinema, in a potentially tough contest in a state that is predominantly conservative yet changing in ways that analysts say could end the Republican hold on the senate seat. Arpaio was able to register as a candidate thanks to a pardon by President Donald Trump. The former sheriff was convicted of criminal contempt for failing to obey a federal judge's orders to stop roundups of suspected undocumented immigrants. For more than two decades, Arpaio was the best known politician in Arizona and headed the state's biggest police department. But his administration was criticized for its harsh approach to undocumented immigration and conditions in his Tent City jail. He faced federal charges of racially profiling Latinos two years ago and was later convicted of contempt. He was voted out of the sheriff's office and almost immediately began flirting with the idea of running for another post. He announced his candidacy for the Republican nomination to fill Flake's vacancy in January, but polls since June have shown him in third place. What happened to Arpaio's candidacy? Many observers expected Trump would would endorse Arpaio, but the presidents did not endorse any of the three candidates in the Republican primary. Arpaio also received little support from Arizona Republicans. Many did not take his candidacy seriously because of his age – 86 – and his defeat in the 2016 elections for sheriff. His candidacy has been seen more as a blow to Ward's campaign. Organizations opposed to the former sheriff's policies said voters would make him pay at the ballot box for the costs they had to bear to legally defend Arpaio from the lawsuits filed against him. 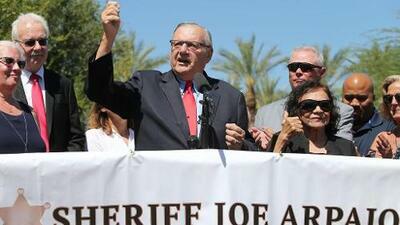 Arpaio's campaign strategy was criticized by analysts and news media in Arizona. From his fund raising to his public appearances, the candidate was described as “lethargic” and “absent.” Some blamed it on his age. During an interview with The Arizona Republic, Arpaio was unable to detail his stands on trade, health insurance or foreign policy, and could not explain his agenda for the Senate if he won the seat. The newspaper reported recently that the Arpaio campaign was in crisis. Chad Willems, Arpaio's campaign manager for 20 years, abandoned the race, the Arizona Republic reported. And the former sheriff hired two new staffers who people close to the campaign say are more interested in attacking Ward than guiding him to victory. Arpaio's candidacy appears to have helped McSally by splitting the Republican vote. All three candidates have expressed support for Trump policies. Arpaio toured the border area, where McSally enjoys strong support because she represents District 2, which covers part of the Arizona border with Mexico. She had endorsed Trump's border wall and focused much of her campaign on border issues. “I have the strongest record of voting with President Trump,” McSally told Fox News earlier this month, although she criticized Trump during the 2016 presidential campaign. Ward, who ran in 2016 against the late Sen. John McCain, has a Twitter account where she displays a message that Trump published when she announced she would run against Flake. In the final days of the campaign, McSally and Ward focused on showing that they are the better candidates. Ward has also clashed with Arpaio, and her husband said it's unlikely the former sheriff would live long enough to serve a full six-year term in the Senate. McSally, who led the polls, focused her campaign on the Democratic candidate, Kyrsten Sinema. A new add this week complained that Sinema wore a pink suit to a protest while McSally was serving in the U.S. Army. “While we were in danger in uniform, Kyrsten Sinema was protesting against us in a pink tutu and disparaging our service,” McSally said in the add. Sinema's spokesman said the add showed McSally's primary campaign was in trouble. “If Rep. McSally is fighting so hard to win what should be an easy primary, it's difficult to imagine how low she will go later,” spokesman James Owens said in a statement sent to the Arizona Republic. Arpaio also has used social networks to attack Sinema, saying that Democrats are worried by his candidacy. He added a link to Trump's social networks, a sign that analysts say meant he was trying to bring the president into the electoral fray.